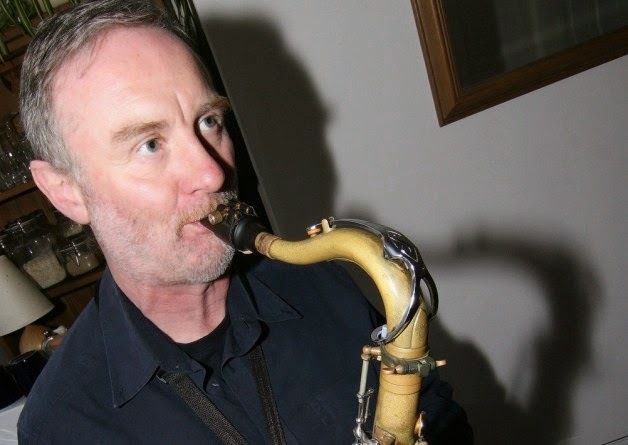 Saxophonist Pete Lyons has been an integral part of the Sheffield jazz scene for many years, both as a player performing regularly and as a part of the long-established Sheffield Jazz Workshop. To mark his 60th birthday, Lyons composed the LX suite; 19 compositions to be played by a quintet of Manchester-based musicians plus a Sheffield duo and septet. The three strands of this ambitious project were called LX:V, LX:II and LX:VII and were premiered at Sheffield Millennium Hall in April of last year. LX:V for quintet was the first of the groups to be recorded and released as an album. Rather than the traditional head-solo-head format, Lyons prefers to write extended forms and his compositions contain many contrasting sections and changes in direction. He utilises the two-horn front line creatively, often spreading the melodies between the two voices. The album opens with Laying Tax, with the rhythm section playing a bembe groove under the winding melody. Pianist Dan Whieldon solos first and the strong bass and drums team of Gavin Barras and Johnny Hunter respond to the shifts within his playing. As in a number of the pieces, two-horn interplay between Lyons and John Hulme can be heard toward the end. Relaxing is perhaps the strongest example of Lyons’ style of composition, blurring the line between composed material and improvisation. Loose grooves and flowing melodies are counteracted by an angular melodic line played by the horns and piano in the middle of the piece. Lyons and Hulme both listen keenly to each other as they play and are supported well at all times by the strong rhythm section. Drummer Johnny Hunter has the ability to be creative and musical in a number of different styles and bassist Gavin Barras contributes some melodic and well-considered solos throughout the album. Two of the pieces on the album, Live Axiom and Less Than Exact, showcase the group’s ability to play swing as well as straight feels and grooves. The up-tempo Less Than Exact leaves space for Lyons, Hulme and Whieldon to stretch out as they solo, the whole band playing idiomatically and musically. It’s clear that Pete Lyons has established a clear compositional voice and his particular talent for writing interesting ostinatos and bass/piano patterns is showcased well by the band. He has plans to record and release both the duo and septet music in the coming year.